Snrky: I hope he's testing == false so he saves me some effort. I hope he's testing == false so he saves me some effort. Ternary operator humor is the bomb. I like the quote on Wikipedia: "Some corporate programming guidelines list the use of the conditional operator as bad practice because it can harm readability and long-term maintainability." As if you can't achieve the same issue with judicious use of an iif. I once used Log Parser 2.2 (Coding Horror) to pick apart encoded ip addresses in a series of logs using an obscene number of nested iif statements on a single sql-like line. It worked, but I started the script with a comment that indicated that if it were to be changed, it should be thrown away in favor of another option. Snarky: The architect put them there. He says it works in all instances. 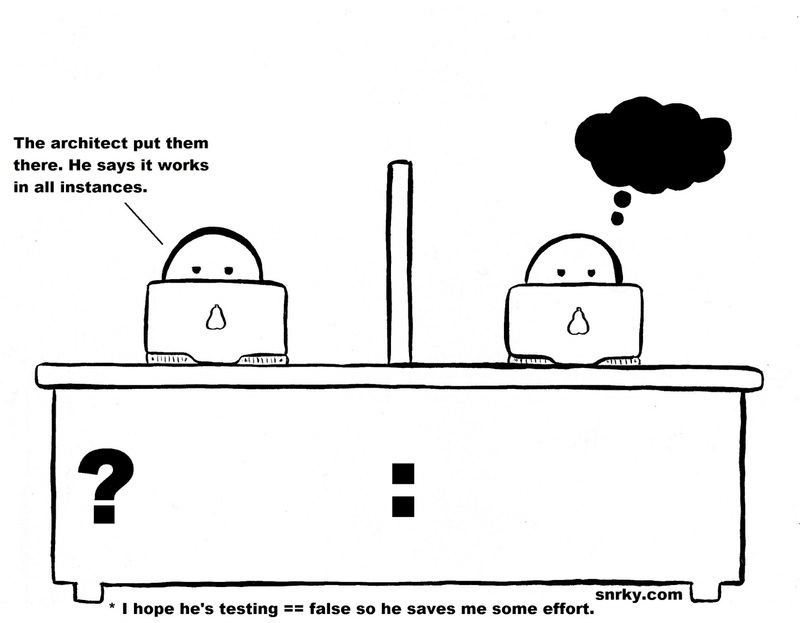 Title: I hope he's testing == false so he saves me some effort.